Convergent boundaries form when two crustal plates are colliding. 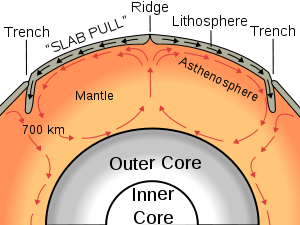 The plates form a subduction zone with one plate descending beneath the other plate. 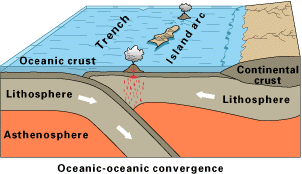 One of the converging plates must be an oceanic plate to form a subduction zone. When two continental plates collide mountain ranges like the Himalayas form. The subducting plate is being recycled as it begins to melt at about 100 kilometers. The water soaked oceanic plate forms molten rock that collects in magma chambers. The molten rock is buoyant because it is hotter and less dense than the surrounding rocks. The rocks move up through the overlying rocks to erupt at volcanic vents forming an arc of volcanoes on the continental side of the subduction zone. Converging plates in subduction zones often become locked. Pressure builds in the rocks until they fracture. If the break is along hundreds of kilometers of fault line a megathrust earthquake occurs. The breaking rocks allow the overriding plate to slip over part of the subducting plate all along the fault line. The plate movement on the ocean floor can cause a tsunami. The 2004 Indian Ocean tsunami was triggered by a megathrust earthquake at a convergent boundary. Convergent Boundaries Learn how these boundaries have created the Ring of Fire in the Pacific Ocean.